"Oh, hey, who are you playing with tonight?" "Scott Amendola." "I&apos;d better get in line right now!" The musician in question was John Shifflett, bassist for the Scott Amendola Trio, and the conversation was an immediate reminder that many in the crowd aren&apos;t just fans of jazz - at some point or another, they&apos;ll be up on stage. 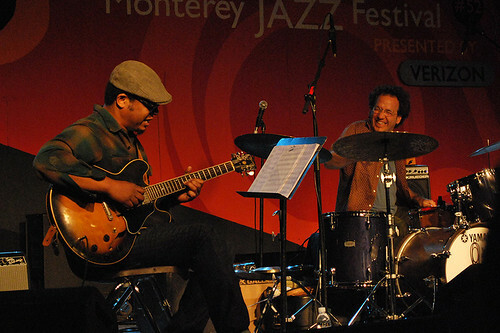 Scott Amendola and Jeff Parker, by Mike Rainey How best to describe the Scott Amendola Trio? The first piece started as jazz with a funk edge and a serious groove. As it progressed, each instrument gradually slid more out of sync with each other, moving from something traditional into something experimental and unpredictable, like a piece by Zeena Parkins. Then, just when the audience expected the piece to fragment entirely, the disparate elements coalesced again into a coherent and driving finish. The band obviously enjoys playing together, and Amendola makes drumming look easy. His wrists are so loose that it seems that he&apos;s merely patting the skins, a visual that belies the intense sound emanating from his kit. This song was the warm-up for the much more avant-garde pieces to come. The next song kicked off like the intro to the song Iron Man - on speed. It quickly became faster and louder - like heavy metal without the structure - and trailed off into experimental electronic sounds. The Scott Amendola Trio are not for the faint of heart. But if you&apos;re truly ready for jazz on the edge (or even a little past it), you&apos;ll find them a rewarding listen. For all our coverage of the Monterey Jazz Festival, see our Monterey Jazz Festival category.